The Real Office CRM allows you to easily manage all of your contacts, send newsletters and follow up leads. Contacts can be grouped into custom groups or use common pre-existing groups like "Buyers", "Tenants", "Vendors", "Investors" etc. Attach property requirements to any Contact to match them with a listing. Notes including automatic follow up emails sent to your team members. Attach listings to prospective buyers / tenants. Automatic lead grabber from realestate.com.au / domain.com.au / your own website / premises.com.au imported directly into your database and attached to the listing they have enquired on. 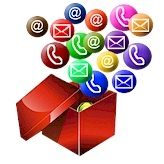 Automated emails and SMS scheduled to go out using custom templates or pre-existing ones.